Welcome to Steve’s 12th annual NCAA March Madness bracket bonanza! To fill out your bracket, you’ll need a CBS Sports user account. You can sign up for free if you don’t already have one. It’s open to anyone and everyone, so invite your friends/family/co-workers. Anyone can win regardless of how much or little you follow college basketball. Let me know if you have any questions. Have your picks saved by Wednesday night (March 20) just to be safe. The deadline is Thursday morning. There is no cost to play. Winner will get bragging rights for the year. Sticking with My iPhone 4. For Now. My first iPhone was the 3G. I waited several hours in line the day it released. So a year later when they launched the 3GS, I was still within my contract. But I didn’t mind, because I didn’t think the upgrade was really worth paying the full non-subsidized price. I knew I’d be better off waiting another year for the 4. Of course at that time I had no idea what the 4 would entail, but I was pretty certain it would be more revolutionary than the evolutionary 3GS was. Fast forward to 4-Oct-2011, and it’s deja vu all over again. I currently have the iPhone 4 and am presented with yet another evolutionary upgrade option: the iPhone 4GS. Don’t get me wrong, I’m not knocking the 4GS (or the 3GS even). If I wasn’t under a 2 year contract and could get the fully subsidized upgrade price on the 4GS AND know that when the iPhone 5 comes out I could still upgrade to it at the fully subsidized price, then I’d be all for it. Unfortunately, the carriers don’t allow this. As it stands now, I got the iPhone 4 the day it released and won’t be eligible for a subsidized upgrade until November. And if I upgrade then, I certainly wouldn’t be in a position to upgrade to the 5 when it releases. In the build-up to iPhone 4GS, there has been a lot of consistent speculation about an iPhone 5. This leads me to believe that the iPhone 5 is well underway in development, much more so than the 4 was when the 3GS launched. True 4G. There are so many Android smart phones taking advantage of LTE. Despite what the 4GS launch would like us to believe about HSDPA, it is merely an enhanced version of 3G. And even though many argue that LTE isn’t true 4G either, it is certainly faster than HSDPA. With Android LTE phones already in the market, Apple will need to release a competitor sooner rather than later. And next summer in my opinion is too late. Bottom Line: If you have a 3G (or older) iPhone, or any other phone without a contract, then by all means the 4GS is a fine phone to get. But if you have an iPhone 4 and value your money, wait for the iPhone 5. Your wait might end up being shorter than you think. 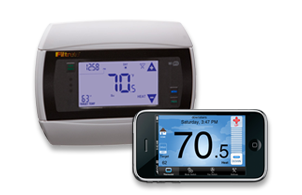 Wouldn’t it be awesome to control your thermostat from anywhere in the world? At first I was surprised that options even exist to accomplish this feat. But this quickly turned to disappointment at how few choices there actually are in the marketplace. I found expensive units. Units that require multiple pieces of hardware. Units that seem to need a professional or a PhD to install. And units that require a monthly service fee to manage the thermostat remotely. But after a bit of digging, I was pleased to find a solution that fell into none of those categories: the Filtrete 3M-50 sold through Home Depot for just $100. Sure $100 may seem like a lot for a thermostat, but compared to the other WiFi options out there, it’s a steal. I realize your installation experience may vary depending on the type of HVAC system in your home, but I got lucky. Because the unit requires a “C” wire for power (the WiFi is too much for batteries alone), you may find yourself in a more difficult situation. Whoever installed my previous thermostat had connected all 5 wires going from the furnace to the thermostat. But like a good number of people, my HVAC only uses 4 wires. So I was able to use the free wire as my “C” wire (as demonstrated in this helpful video by the radiothermostat people). I have to admit: if I didn’t have a free wire available, I likely would have returned the unit. So I can see this requirement being the first big hurdle that may weed out potential customers. Once I had the wires connected, mounting the unit was simple. I’ve read a number of complaints in the reviews at HomeDepot.com about the look of the unit, especially with the wires. But I can’t see any wires at all after putting the top face plate on. My tip here is to install the unit higher than the hole where the wires come through the wall to make sure they are taught and lay flat on top of the unit. After the installation is the WiFi setup. Unfortunately there is no documentation provided with the unit on how to do this. I recommend going through all of their YouTube videos and the documentation on their website at http://www.radiothermostat.com/filtrete. You really want to review all the materials before you jump in, as it will likely save you the hassle of dealing with errors. I’d say this is one area where they could improve. All of the info is there online, but it really should be contained in a single location with a clear order of events. I had no problems configuring the unit to my local network and was managing the thermostat in no time through both the Windows program and their website. I did however experience a glitch with the free iPhone app (Radio Thermostat). At first it gave an error and wouldn’t connect. I deleted and re-installed the app and re-provisioned the WiFi and it connected just fine. I confirmed that the app could control the thermostat via both WiFi and 3G. Being a single homeowner, I’m thrilled at the prospect of saving energy and money with my new thermostat. If I make plans after work or go out of town, I can relax knowing my air conditioner and furnace don’t have to run needlessly. The website can also be used to create and manage an endless number of programs to run. Currently, the mobile app can only change the temperature or turn the fan on or off, which isn’t too shabby for being free. But I’m hoping they will add the program features soon as well. Bottom Line: For just $100 and a few hours of my time, I now have a new touch screen thermostat that is manageable from any computer or my iPhone. I’m not sure which is better: having this amazing capability, or the comments I get from impressed friends and family. It’s kind of shocking how quickly Netflix has managed to go from internet darling to persona non grata. I remember a time when everyone, including Netflix, was out to stick it to Blockbuster. With their recent actions, it is clear Netflix simply wants to fill the big-bad-video-bully spot relinquished by Blockbuster. January 2010: Netflix sells out to the studios by forcing subscribers to wait a month for new releases. November 2010: Netflix increases prices for DVD plans. They justify this by including online streaming (which was already included in almost all the DVD plans already). July 2011 (less than 8 months later): Netflix reneges on the previous plan change by now charging $8/month for the included streaming. So congratulations Netflix, you are the new Blockbuster. Bottom line: As with their flawed logic for delaying new releases, I believe the unintended (and unfortunate) outcome here will be to push more legit users to piracy. Where is the next online video company to save us from the new tyrant Netflix? Welcome to Steve’s 10th annual NCAA March Madness bracket bonanza! It’s open to anyone and everyone, so invite your friends/family/co-workers. Anyone can win regardless of how much/little you follow college basketball. Let me know if you have any questions. Have your picks saved by Wednesday night (March 16) just to be safe. The deadline is Thursday morning. The Cincinnati Rollergirls are awesome. I’ve enjoyed their games and was even spoiled enough to watch all the action up-close from the posh purple couch once! If you haven’t been to a game yet, what are you waiting for? And don’t forget to arrive early for tailgating and the $1 beer happy hour. I already own an iPad Nano. Except my “nano” can make phone calls and even has a camera! (for those dense readers, I’m referring to my iPhone). I already own an iPad Pro. Except my “pro” has a full physical keyboard, built-in camera, and can do everything a desktop PC can do. (again, for those still not catching on, I’m referring to my MacBook Pro). Bottom Line: I’m proud (and $500 richer) that my logic didn’t succumb to the all-powerful Apple marketing machine this time. Now, if only Steve Jobs would tell me the new iPhone release date, I’ve got to get that request off work submitted.